After a 2004 porta potty mishap that left he and his potty-training daughter soiled and disgusted, commercial banker David Sauers, Jr. became determined to end the substandard bathroom conditions that always seemed to plague outdoor events. Sauers teamed up with good friend and engineer Robert Glisson, and together they sought to develop a comfortable and sanitary portable restroom option for the outdoor facilities industry. 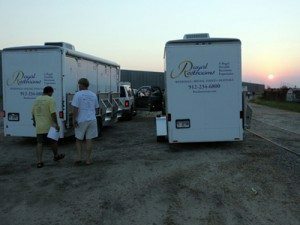 Royal Restrooms of East Texas provides turnkey, convenient and professional luxury portable restrooms and showers for weddings, festivals, disaster recovery, black tie events and business/construction remodels. The mission of Royal Restrooms is to lead the luxury portable restroom and shower rental industry by providing superior products, the best possible service, and a lasting positive experience for every client and guest served. Royal Restrooms of Texas has 3 locations to serve all of Texas with multiple portable toilet rentals in a variety of sizes to accommodate any event from deluxe portable toilets to luxury portable bathroom rentals. Our portable trailer restrooms come in single stalls to 10 stall trailer restrooms for rent giving you a lot of options, The best customer service and the Royal Restrooms experience. Finally, the team decided to make their luxury restrooms fully mobile and housed them inside custom trailers that provide outdoor lighting, stairs with handrails, and occupancy light indicators. Royal Restrooms provides turnkey, convenient and professional luxury portable restrooms and showers for weddings, festivals, disaster recovery, black tie events and business/construction remodels. When it comes to Outdoor weddings the restroom may be the last thing you think of renting. Royal restrooms has made your outdoor wedding event able to handle large numbers with its Wedding restroom rentals that suite any type of environment and decor. We understand everything about your wedding restroom rental needs to be as luxurious as your wedding event. trailers, offers emergency planning assistance to organizations that are integrating portable bathrooms into their existing or developing plans. For more information on the company’s invaluable emergency planning service. It’s never too soon to plan for the unexpected.